One of the easiest ways to never get locked out of your home or vehicle is to have a set of spare keys. Leaving the spares with a trusted neighbor or a family member allows the peace of mind that your property can still be accessed if you lose or misplace your keys. If a key breaks in a lock, it is no problem to remove the broken key, but that key must be replaced. Key duplication can be done several ways, but the best ways are on key machines. 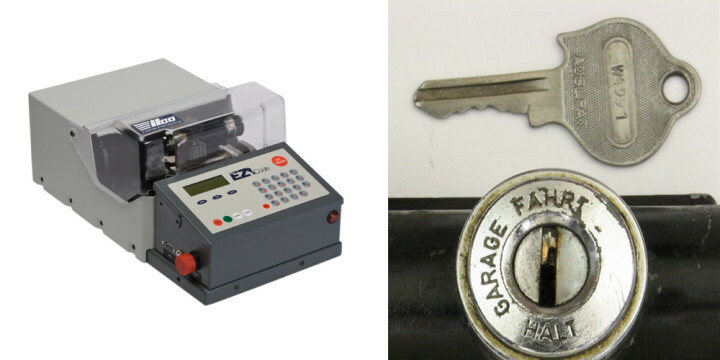 There are several types of key machines that can cut different types of keys. 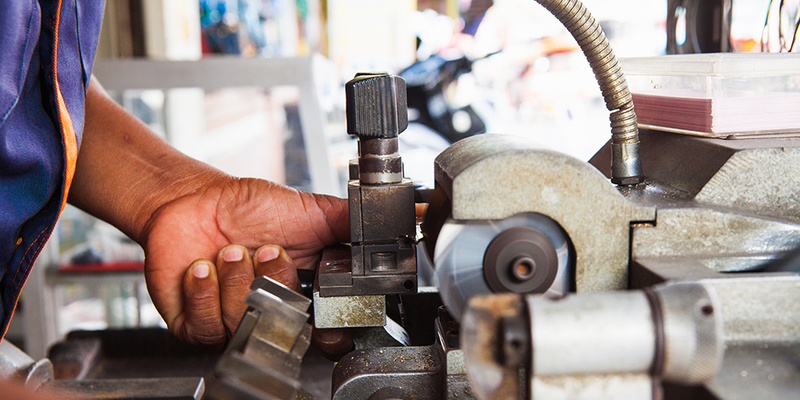 You may need a different type of key machine depending on if you have an original key or need one made from scratch. The basic nature of key duplicator is to make a copy of a key you have in your possession. For that reason, it is not illegal to own a key duplicator, and even though some states might classify it as a lock picking tool, it is anything but. When you are using the key duplicator it is very important to wear your eye protection at all time. When the key is being cut, a blade is spinning to grind the metal. This grinding will send small fragments of metal into the air. Keeping these fragments out of your eyes will save you a trip to the hospital, and maybe even an eye. Once you are safe, the key you wish to cut and the new key blank are fastened to their respective sides of the machine. The key blank should be placed on the side of the key duplicator that lines up with the cutting tool, and the original key should fall on the side of the alignment tool. The blade is obviously the rotating sharp instrument, but the alignment tool might not be as obvious. Your key duplicator may have a key guide (also known as an alignment bar) that makes sure that the keys are both even, but this is not the alignment tool. The alignment tool will be an edged piece of metal that is even with the blade. Before putting the keys on the machine, you may wish to check the calibration of the machine. You can do this by placing an even piece of metal along the key holders. Lift the key holder and check to see that the blade of the cutting tool and the leading edge of the key alignment tool both hit the metal evenly. The keys can then be fixed to the machine and are usually fastened in place with small vice grips. The keys can both be elevated so that they line up with alignment and cutting tool. At this time, the keys are moved horizontally along the machine until all the necessary cuts are made. The end result will be two keys with the exact same cut. The newly cut key should then be sanded to remove any burrs in the metal. With the burrs gone both, keys should fit perfectly in the original key’s lock. This process is quite simple, but it can become more difficult based on the complexity of the key. For instance, car key duplication for a newer model can have more steps than simply cutting a new key the existing one. If you want to make a key without the original, you will need a code cutter. At this point, you will need to call a locksmith so that they can use their professional resources to find the corresponding groove depths to your key code. This is most common for keys that are lost or broken in a way that the grooves could not be decoded. On a standard house lock, the key code can sometimes be found on the lock or the key itself. That key code corresponds to a list that your locksmith will have, and it will tell them how to cut the key. Finding the key code for a vehicle is slightly different. Most often you or your locksmith will have to contact your dealer and use the car’s vehicle identification number (VIN) to find the code. This code, in conjunction with the make, model, and year of your car will allow a fresh key to be made. This process was once done manually but now is handled by automated machines. The code is entered into the code cutter and the key will be automatically cut to the correct specifications. This will only assist in producing a physical key. Further processes will need to be used in the cases of replacing the car’s key fob or programming a new transponder key. 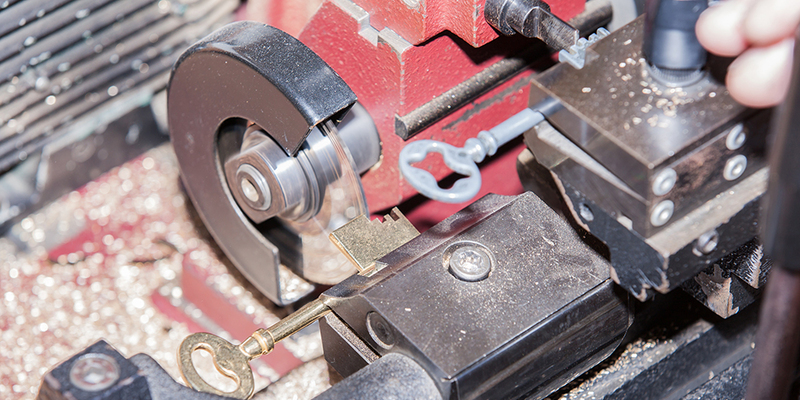 A standard key can either be ground down to the correct depth or cut with a punch machine. A punch machine is used to specify the depth and width of the cut and forces a blade down onto the key. These machines can either be electric or manual, but do require the key code for greater accuracy. The plus side of the punch is that it will not need to be sanded because it will not have any burrs that need removing. If a punch is not desired or is not accessible then the key will be cut by a similar blade to the key duplicator. Laser key cutting machines can be in the style of a duplicator or a code cutter. The difference of the machine is that routers out the thickness of the key instead of notching out grooves on the key’s blade. Laser cuts are very commonly found on the keys of post-1990’s cars. A standard key will resemble a serrated blade, but a laser cut key will have paths cut into the sides that change its thickness. These types of keys are designed for car locks that use a slider system which provide the vehicle protection against bump keys as well as most tryout keys. Despite the key being called a laser cut, there are no lasers that are involved in the process of cutting them. The cuts are made instead with a high-speed bit that works as a router. The bit is most commonly coated with titanium to extend its usability and cutting effectiveness. Besides the difference of how the key is physically being cut the code cutter and key duplication will work the same. The duplicator will need the original key to guide the device and the code cutter will simply need the key code. You now know how to use multiple types of key cutting devices. If you are planning to try any of these methods on your own be sure that you are safe, and that you have met the proper credentials so that everything is legal. Laws will vary depending on your location, but safety is universal. Do your research to find the best method or machine for your key needs whether they are personal or professional (as long as they are legal). Like in most aspects of locksmithing (and life in general), the end result will refine with practice and patience. Keep a level head when working with the tools, have a respect for the materials, learn from your mistakes, and you should be making great keys in no time. Remember that duplicate keys protect you from lockouts but they also make you more vulnerable to theft if the proper precautions are not taken. Always make sure that you trust the people that you are giving your keys to, and that they are responsible enough to keep those keys safe. Now go forth and make keys.